Paul Maurice Kelly was born on 13 January 1955 in Adelaide, South Australia. Kelly is an Australian rock music singer-songwriter, guitarist and harmonica player. Kelly has led many groups including Paul Kelly and the Dots, Paul Kelly and the Coloured Girls and Paul Kelly and the Messengers. Kelly is one of Australia's most well-known singer-songwriters. His importance was recognised in 1997 when he was added to the Australian Recording Industry Association (ARIA) Hall of Fame. Kelly writes and plays in many music styles, from bluegrass to reggae. His main styles are folk, rock, and country. Kelly's Top 40 singles on the National charts were his 1980s songs "Billy Baxter", "Before Too Long", "Darling it Hurts", "To Her Door", "Dumb Things", and his 2000 single "Roll on Summer". "To Her Door", written by Kelly, was his best local hit. It got to Number 14 on the Australian singles charts in 1987. "Dumb Things" got to Number 16 on the US Billboard Modern Rock chart in 1988. 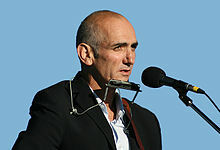 He has also had success with his albums with Top 20 hits on the National charts for Gossip, Under The Sun and So Much Water So Close To Home from the 1980s; Comedy, Wanted Man, Songs from the South: Paul Kelly's Greatest Hits and Words and Music from the 1990s; and Nothing But A Dream, Ways & Means and Stolen Apples from the 2000s. The compilation album Songs from the South got to Number 2 in 1997. His highest charting studio album was Nothing But A Dream which got to Number 7 in 2001. ↑ "The American Society of Composers, Authors and Publishers (ASCAP)". ASCAP. Retrieved 2008-08-15. ↑ "Paul Kelly biography". Music Australia. Retrieved 2008-08-15. ↑ 4.0 4.1 "Paul Kelly". Australian Rock Database. Retrieved 2008-08-15. ↑ 5.0 5.1 5.2 McFarlane, Ian (1999). Encyclopedia of Australian Rock and Pop. Allen & Unwin. ISBN 1-86448-768-2. Retrieved 2008-08-18. ↑ 6.0 6.1 Ed Nimmervol (ed.). "Paul Kelly". Howlspace. Retrieved 2008-08-18. ↑ "ARIA 2008 Hall of Fame inductees listing". Australian Recording Industry Association (ARIA). Retrieved 2008-08-18. ↑ "Winners by Award: Hall of Fame". ARIA. Retrieved 2008-08-18. ↑ 10.0 10.1 10.2 10.3 10.4 "Discography Paul Kelly". Australian Charts Portal. Retrieved 2008-08-15. ↑ "Billboard singles charts". allmusic. Retrieved 2008-08-15. This page was last changed on 31 August 2017, at 09:35.